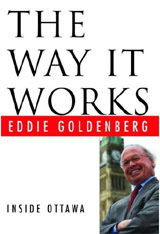 I just finished up Eddie Goldenberg’s behind the scenes look at life in the PMO – The Way it Works. For those not wanting to read the full review, I’d sum it up by saying it’s the kind of book a die hard political hack would enjoy but, unlike something like Paul Wells’ book, it’d be a pretty dull read for anyone with only a passing interest in politics. Let’s start with what’s not covered in the book. There’s not much on Eddie Goldenberg’s personal life since, unlike Bill Clinton, he hasn’t earned the right to tack on 200 pages about his childhood. There are only three words on the Kyoto Accord, so you won’t get any more insight on Goldenberg’s latest machinations on the subject. There’s next to nothing on election campaigns as the book really does try to limit it’s scope to life in the PMO. And, at that, it is successful at giving a behind the scenes glimpse of the way it works. Goldenberg describes the decision making process for several major (and minor) decisions, giving a recap of the balancing between policy and politics which go into all of them. He’s quite blunt about having to consider the political ramifications about all decisions, just as he’s up front that certain appointments are nothing more than patronage. He also makes several references to the pork barreling desires of MPs with what he calls PIMBY (Please in my backyard). Because of admissions like this, the book deserves to be taken a bit more seriously than, say, Sheila Copps' book. Goldenberg does admit that Chretien wasn't infallible, calling the GST reversal “a big mistake that would affect his credibility as PM”. At the same time, the understandable bias is still there and the book certainly paints JC in the most favourable light possible. Also receiving heaps of praise is Stephane Dion, which is a little surprising given that the book was released in the midst of a leadership race where Eddie was helping out Bob Rae. Dion is described as being like a son to Chretien and was one of the few ministers invited out to Harrington Lake with Jean. Receiving quite a bit less praise than Dion was, of course, Paul Martin. Goldenberg doesn’t go out of his way to smear Martin at all, but he does get a few subtle digs in here and there (“very, very important”). He also claims that Martin opposed Meech purely for political reasons and that Tim Murphy once told him that “Paul’s people didn’t think it would be good for [Martin] to be associated publicly with anything in Trudeau’s memory”. Despite these less than flattering anecdotes, Goldenberg goes to great lengths to praise Martin’s work as Finance Minister and the good working relationship Paul had with his boss. And when describing things like the Martin/Tobin broadband battle during the 2002 budget, you really do get the sense that he isn’t taking sides. As I said in the beginning, there are a few behind the scenes stories which political junkies will appreciate. Goldenberg recaps several meetings with George Bush, and tells of how Lucien Bouchard spent his entire meeting with Bill Clinton asking advice about private schools rather than talking about Quebec separatism. There are also a few surprises here and there in the book, such as the revelation that Ralph Klein was one of the federal government’s biggest allies during the 2000 Health negotiations. And I know I got a kick out of guessing who the cryptically described politicians in Goldenberg’s less than flattering stories are (for example, the “Toronto MP and future Paul Martin Cabinet Minister”). Probably the most interesting thing about the book is to see what Goldenberg considers to be Chretien’s greatest achievements. And given the amount of ink he spills on different subjects, it’s clear to me that he sees the innovation agenda, the Clarity Act, the economic recovery, and, maybe above all else, the decision to stay out of the Iraq war, as the most significant accomplishments of Chretien’s decade in power. posted by calgarygrit at 10:16 p.m.
As time goes on, it does seem the innovation agenda might wind up as Chretien's greatest legacy. While I welcomed the decision to stay out of Iraq, I was unhappy with the fashion the decision was announced, I suppose. You make this sound quite interesting, I have to say. The frankness and bluntness you describe is the most appealing part. By Jason Bo Green, at 9:47 p.m. I'm actually in the middle of the book right now. Your post is a fair assessment. I find How It Works to be more of a practical "how to" reference book with occasional war stories. I guess this is what you meant by the phrase, "for political junkies". Personally, I would have liked to have read more war stories. Slightly differing from you post, I happen to take his "greatest achievements" (to use your terminology) with a grain of salt. By Canadian Tar Heel, at 11:35 p.m. I was struck by the deep effect that the break-in had on JC. I never made the link between that and his fear of nutty pissed-off separatists. It is one thing to wonder, but he actually expected something. That placed the Shawinigan handshake in a whole new context (a shellshocked and nervous PM, rather than a cold angry brawler). I remember him being pretty cavalier and brave at the time. Behind the scenes he was shaking like a leaf. Very human. By Denis, at 9:25 p.m. It's always been a little puzzling to me that Chretien and others thought his greatest achievement was keeping us out of the war. It is puzzling because in reality HE didn't keep us out of the war. He was very clear back then that we should do something in Iraq, Saddam needed to be reigned in, he was willing to go to war... IF the UN supported invasion. Because of France and Russia, the UN did not approve the war. So they are responsible for us not being in Iraq. Chretien outsourced our foreign policy decision making. By Cerberus, at 10:16 p.m.
Every political memoir by an insider has some historical revisionism in it, it is how you begin the process of sanitizing your legacy. CG, What hurts worse? The fact that your boy was rolled by Bains and Alghabra, or the reason that they chose him in the first place? By Grithater, at 5:35 a.m. I have found Eddie's book to be a compelling description and remarkably accurate one of the temperature and workings in Ottawa over the 1990s. I enjoyed the mix of anecdotes and insight. By pumpernickel, at 11:40 a.m. Interesting analysis of the book. I've thought of giving it a go a couple of times, but there's always something else in Chapters that ends up catching my eye instead. I gave Granatstein's latest a whirl and found it was pretty enjoyable, and I've got the montly journals to peruse too before I can even think of shelling out for another fun text. By RGM, at 4:19 p.m.
By Data recovery software, at 2:15 a.m.
By camobel, at 5:34 a.m.
By Cretu Ciprian, at 12:26 p.m.
By raybanoutlet001, at 1:21 a.m.
By Love Kpop, at 12:01 a.m.
By love, at 10:50 p.m.